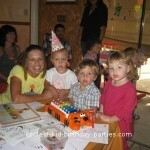 I wanted to have a combined party for my 6 years old boy and my 4 years old daughter because their birthdays are close and they both have the same friends. As you can imagine at these ages they both have already their own tastes and especially because of the difference in gender the problem was bigger. He wanted a monster truck party and she wanted a Barbie party. I wanted to have the party in the pool of our community, so I wanted a theme that related to the water. Since summer started I noticed that they both were hooked to the new Disney TV show “Jake and the Neverland Pirates”. I started to look for party supplies, but there is nothing in the market yet with this theme, so I decided to start using my imagination and as I am very crafty it was very easy to come out with few ideas. 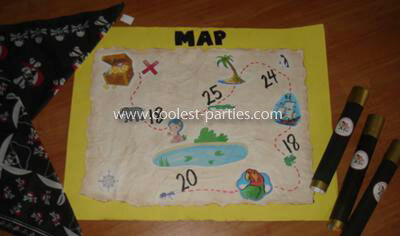 I decided to pick a treasure map theme for general decoration and add the characters of the show as much as I could. The invitations were done with the treasure map background and the show’s characters in the front with few lines here and there of the show, like “YO, HO! LET’S GO!” and “AHOY MATEYS!”. I told neighbors and friends to save paper towel rolls for me so I can create telescopes to give to the kids for the treasure hunt game. I painted them black and cut cereal boxes cardboard and painted gold for the top and bottoms. I didn’t like the idea of a regular treasure hunt game with clues as I had too many kids and little ones, so I came up with an idea of a treasure hunt where you have to follow the instructions of the map. Those were all funny instructions like, ant steps (on your tip toes), frog jumps, penguin walking, alligator snaps and elephant steps. I put pictures of all those animals in the map and then a few visual clues between the instructions, like look for the parrot, the pirate ship, the palm tree and the mermaid. That’s when we used the telescopes to look for our clues. The parrot was made with cardboard and I stuck it in a branch tree, then the pirate ship was a miniature ship that I had in my husband office and I hid behind some bushes. The pool is all surround with palm trees, so that was a given and then I put a a Dora mermaid doll by the pool ladder. The kids had a blast following all the instructions of the map and pretending to be pirates looking for clues and the parents loved to see their kids doing all the fun steps. Of course the best part was to actually find the treasure chest full of goodies for everybody. I filled it with beads, eye patches, party rings, little crowns, plastic gold coins, chocolate coins and pirates whistles. I forgot to mention that before we started the game I gave every kid a bandana to wear in their heads like pirates, along with the telescopes. My homemade creation that took the most time was the picture frame/water balloon target. I used a light wood board and hand-painted Jake and Issy with Skully (the parrot) and I painted a gold coin to have the hole done where the kids will put there faces to take their pictures and at the same time I used for the kids to throw water balloons to try to make it through the hole. 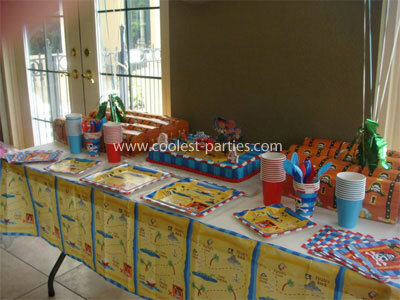 It was a lot of work but at least it had to uses in the party as good as decoration in the pool area. I found at an online store a game with a treasure map and the kids had to put the treasure chest in the X, so we played that too. 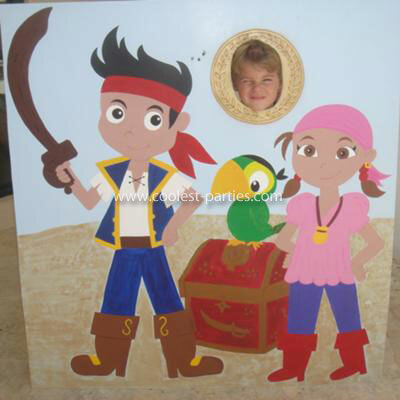 The cake was simple – a treasure map, and we used cookie crumbles with brown sugar, so it gave it the sandy look and then I printed a few images in cardboard like the characters and a parrot. I bought a wood ship and painted and I ordered a few plastic palm trees to put around. I found a treasure chest candle, so that came in handy. For goodie bags I gave mini treasure chest with pirates tattoos, pirates silly bandz, an eye patch, a mini telescope, beats, plastic gold coins, chocolate coins and few other candies. As a thank you cards I used kind of the same idea of the invitation but I add the picture of the guest kid in the board that I made. Everybody loved the party, I had a lot of compliments from the moms about the games and the decoration, especially the pinata. 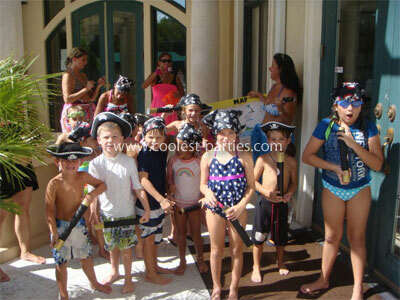 The kids had a blast in the pool and with the games and of course with all the goodies that they got from the treasure chest, the games prizes, the pinata and the goodie bag. 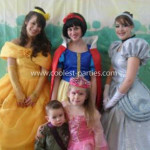 I had a blast putting it together and my kids enjoyed not only the party but all the 3 weeks before while I was creating everything. Hello what a wonderful party. My son is having a jake and neverland pirate party as well. I was trying to hand make the treasure chest and saw yours were bought. Please where did you get them? I’m having a Jake party in a couple weeks too. Thanks very much for the ideas. Where did you get the treasure chests? My son is having a Jake party and I’d love to use those as favor boxes! I found them in the Dollar store, in packages of 4. Where did you find the jake & neverland characters on the invitation? I’m assuming they are high resolution png files, and I’m having trouble locating. Thanks for your help. Hi, I’m trying to make an invitation with the pirate map but can’t clear off the images of the maps I’ve found on Google so that I can enter the party info on the map. How did you do it? Thank you! 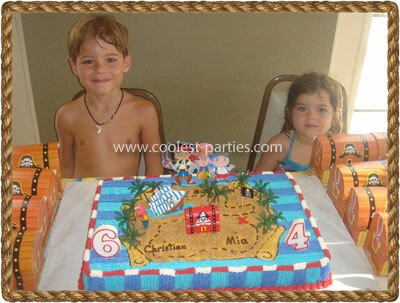 I want a Jake and the neverland pirates cake for my birthday. Hi I am also having trouble finding Jake party supplies for my boys second party. Any advice on the pinata would be great! Totally cute cake!! How did you make/print Jake and his friends at the back of the cake? You mentioned cardboard but how exactly did you do that? Thanks!! where did u find the pinata my son is having a Jake party in September and I want it to b really nice and also which dollar store did u find the tresure chest boxes im in Louisiana.If u don’t mind me asking. The treasures chest where from the dollar tree store. Good luck! I just google jake and the neverland pirates images. I picked one, printed the size I needed and glued on card board with a stick between both so it could stand in the cake. I was wondering where did you find the invitations? I google, Jake and the neverland pirates invitations. I don’t have the information right now. But is a lady that will made the design with all the information you want and then send you the file, so you can print it on your own, as many as you want. She is in etsy and her name is Tabitha, that’s as much as I remember. 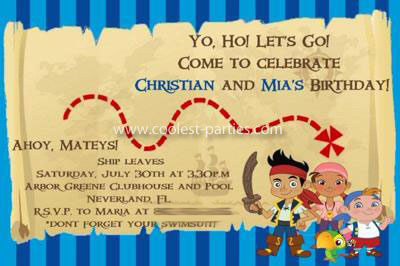 Try going to etsy.com They have tons of Jake and the Never land Pirates birthday invitations and such. I just ordered my invites today. Love the invitations, joined the coolest parties site but thought it might be easier to find some that were already done. I may go down that route. The cardboard photo stand, is that something else you made on your own? I can’t locate that. Greatly appreciate your ideas. Twins b-day is in October so I have time. Hi! 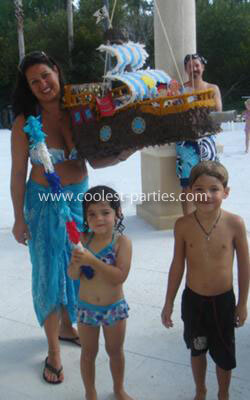 I love all your ideas for the Jake and the Neverland Pirates PartY! We are having one for my son in September! I live in St. Pete and I see that you are in Tampa (from the beginning of the article). Would you be willing to sell the Jake and Izzy standee / photo thing you made? Thought it wouldn’t hurt to ask. :-) Great party!!!! I actually sold it to a friend and she told me she was going to put it on Craigslist. I will contact her to see if she hasn’t sell it yet and let you know. This is the best pirate cake I think. I’d like to make this one for my 1st son’s 4th birthday. If you don’t mind please tell me what you used for the outine of the map. and also the name and the path in the map.